Bring all new flavors to your specialty drink menu with this Torani sugar free vanilla bean flavoring syrup! It's sweetened with Splenda brand sweetener, which offers the taste of real sugar without the calories. This tempting flavor will complement your beverages without overpowering them or being too sweet, while the user-friendly bottle will be convenient for your busy baristas to use. Torani flavoring syrups are specially formulated to resist curdling in milk and to hold up well under heat, making them the perfect choice for espresso-based drinks, brewed coffee or tea, and more. Use this flavor for frappes, iced coffees, smoothies, and even baking! Add the robust, slightly sweet flavors of vanilla beans to anything you make with this sugar free vanilla bean coffee flavoring syrup! This creamy and familiar flavor is a versatile must-have for your coffee shop or cafe. Discover new Torani recipes for this vanilla bean flavoring syrup, including iced sugar free vanilla bean latte, sugar free vanilla bean brewed coffee, vanilla bean steamer, and more! Beyond great in plain steamed milk, to flavor coffee, or in place of regular sugar for hot chocolate. One house favorite is to make Italian cream sodas with it. We are always looking for alternatives to sugar, and this is a great one. Vanilla Bean is one of my favorite flavors from Torani. It is pretty awesome to have a sugar free option. The flavor and sweetness is still really good for being sugar free. A wonderful SF Vanilla Bean Syrup, that not only smells as authentic as it gets, but also taste like the bean was just extracted. We use this in many drinks at home and cant say enough about it. We have also used a few dashes of it in different cooking dishes and dessert pastries that make it taste outstanding. This is a much deeper vanilla flavor than the other two sugar free torani syrups. Excellent in any use you can think of adding it to. I like to order the sugar free syrups to add to my coffee or hot chocolate. I find the Torani syrups in general to be pretty good and the vanilla bean is very rich and full. I like this vanilla bean sugar free torani. I usually buy the french vanilla, plain vanilla or vanilla bean. I really can't tell much of a difference between those 3 flavors. We absolutely love this syrup !If you like vanilla flavors , your absolutely going to love this syrup. We will definitely be reordering this again. Thia mild flavor is the perfect addition to a hot cup of coffee. I even enjoy it in my iced coffee. It gives a bit of seeetness without being overwhelming. Classic flavor in a sugar free formulation. Any coffee shop should have this on hand, for sure! I use it in my ever expanding home coffee bar. A great sugar free flavoring syrup with a decadent vanilla bean taste. This is one of our best selling sugar free options and makes an outstanding vanilla bean Frappuccino. Look out ice cream, here I come!! Not to mention using it in my tea and in baked goods. Best part about it is it's sugar free. Delicious tasting vanilla bean syrup with this product. Torani offers a number of different vanilla syrups but I must say I love this one best! Best tasting sugar free syrup on the market! We use this to make lattes, coffees, frappuccinos and other espresso-based drinks. Give thid sugar free syrup a try, and you will not be disappointed. My customers Love this syrup! It's one of our most popular ones. Such a great true taste that sweetens any type of drink. Whether hot or cold! There isn't really any difference between the various Torani sugar free vanilla flavorings. I've had much better but they do the job and are edible. Simple and sweet! It's not overly strong or artificial tasting and tastes great in iced coffee paired with a packet of stevia! Also awesome combined with caramel syrup or sauce! The only downside is that if you want a stronger vanilla flavor you need to add quite a bit of syrup. Another one of my favorite flavorings from Torani. I use it in coffee, homemade ice cream, making a vanilla coke or (see picture) low carb vanilla coke "float." Great flavor and a tiny step up from the plain vanilla! Delicious and so easy to turn my coffee into a designer drink! I love the vanilla flavor and use it in my coffee every day. 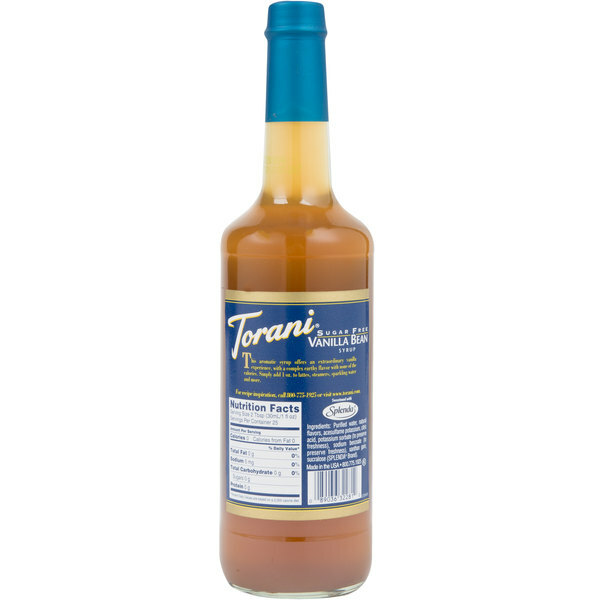 Webstaurant has the best prices on Torani syrups. As an added bonus, this has no carbs! sugar free flavoring can be so tricky - will it taste like chemicals? will anyone in the office drink it? well they do and they say it tastes great! The flavor of this is smooth and rich. There are multitude of ways to use this syrup in prepping. From cooking to an extra touch in a delicious beverage. Plus the facts it sugar free is an added bonus. Enjoy Barb H.
Perfect combination of Vanilla without an overpowering sweetness. Best price I could find online, and I was able to buy an entire case of Torani syrups while mixing and matching flavors. Fast Shipping. The torani vanilla bean is for us the BEST vanilla flavour syrup there is! A pure taste of vanilla with no added sugar or alcohol. Who doesn't love Vanilla Bean! But at no sugar and calories it is the perfect option for dieters, and schools who are trying to comply with nutritional regulations. A great product to have! The Torani Sugar Free Vanilla Bean Flavoring is perfect for those customers that are trying to watch their sugar intake. You can't even tell that it is sugar free if compared to the original. 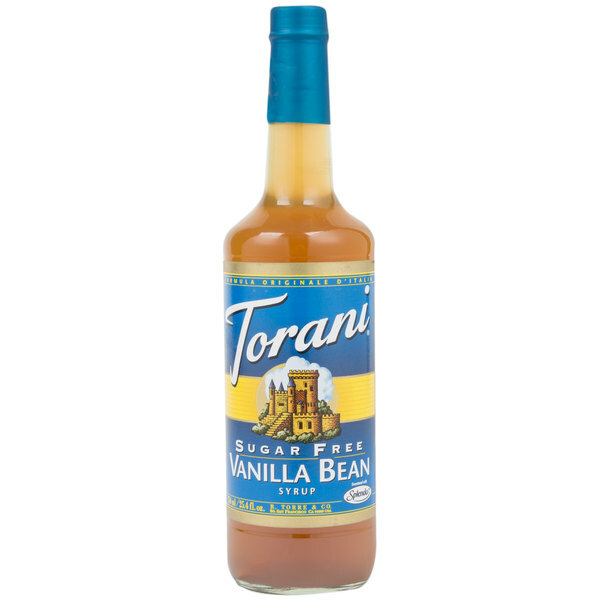 Torani 750mL Sugar Free Vanilla Bean Flavoring Syrup tastes great in coffee, low-fat milk shakes, and deserts. With Torani you can cut calories and prices! I love this syrup in coffee (lattes, frappuccinos) and it's great in chai, too! Torani is my favorite brand and I've stocked up on plenty of their sugar-free flavors. No artificial aftertaste! The sugar free vanilla bean syrup made by Torani is flavorful and rich. It is definitely one of my favorite syrups of the sugar free variety. My husband and I follow a low-carb diet, and the Torani line of sugar-free syrups are our go-to flavoring of choice! He uses the sugar-free vanilla bean with sugar-free peppermint or caramel, and they're great combos! You could probably mix a little of the vanilla bean with just about anything to make a more complex, rich flavor. We recently purchased several new flavors to try, we're enjoying them all! fabulous syrup for people who need sugar free vanilla syrup, we use this syrup alot in my stores and it tastes amazing. even have customers wanting to buy it.